Frozen snacks! But the heat melts them in a skinny minute. I need to get something that will help keep my snack from melting. 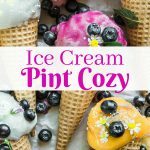 I’m looking for an Ice Cream Pint Cozy for my snacks this summer. I was intrigued by them, I just didn’t understand how she could use a pair of silicone gloves for cooking and not have them melt all over her hands. But they didn’t. You should see mine! No take that back, I would never show you mine, they’re awful, stained, ragged, full of holes, it’s shameful how terrible they have become. I’m going to remedy that real quick with just a few key strokes and I’m at my favorite place to shop in the whole world! You know where that is! 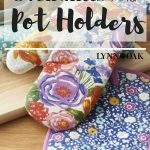 I’m looking for the two handed oven mitt kind. Where you can pull out a casserole from the hot oven and not burn your hands.